While pets make our lives healthy and a bit more whole, they can be expensive to care for. Veterinary bills, grooming, food, toys, treats- paying for our furry little children adds up. But raising healthy and happy pets does not always have to be incredibly expensive. These seven tips will help keep a few of your costs down while still providing the best care you can give. 1. Grow Your Own Cat Grass! Wheatgrass berries are quite inexpensive and you can buy them in bulk. 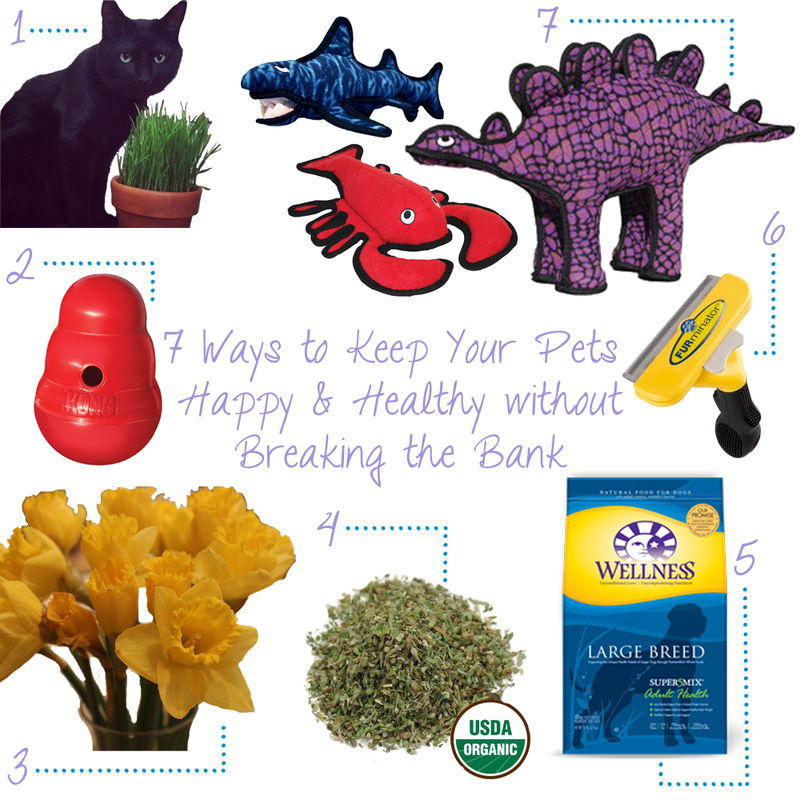 Rather than spending seven dollars a pot for petstore grass, spend a dollar or so on your own! Shade (pictured above) loves his wheatgrass; make sure you subscribe using the buttons on the sidebar to see an upcoming post detailing how to grow your own! 2. Buy Toys That Engage Your Pet. Toys like Kong’s Wobblerkeep your pets busy when left alone. This keeps your pets from getting bored- saving you from having to replace doors and baseboards, and your pets from ingesting possibly toxic debris. 3. Remove Pet-Toxic Plants From Your Home and Yard. Doing this prevents costly visits to the emergency room, keeping your pet healthy and your wallet fat. The ASPCA has a great resource for checking which plants are toxic to different types of animals. Check out the database here. 4. Buy Catnip in Bulk. Cats go crazy for catnip, and constantly replacing toys filled with it can get expensive. Look for organic catnip in bulk at your local health foods store. 5. Buy the Expensive Food. While it is a bit more costly each month, the more expensive foods have higher quality ingredients, higher protein contents, and can provide specialized supplements for different types of pets. Wellnesspet foods offer a number of specialized foods, including the large breed dog food that my pup Tinkerbelle, and our family’s dog Kiwi, eat. This specific food contains glucosamine, providing extra joint help for large dogs, like mine, who are prone to joint problems. 6. Invest In Good Grooming Tools. Having high quality grooming tools on hand help keep your pets looking great, without the extra cost of a groomer. Also, regular brushing keeps your pet’s skin healthy, removes debris, and helps to prevent hotspots. I love the Furminator. 7. Buy Dog Toys That Last. Constantly buying cheap dog toys that are easily ripped apart can add up. Instead, buy better quality, more expensive toys that last. I swear by Tuffy Toys – Tinkerbelle has a collection of them. She has had her shark and lobster since she was six weeks old. Now, at nearly two, they are still in great shape. Not a bad investment for just under twenty dollars a pop. Also, don’t forget regular vet checkups, plenty of exercise, and lots of time with you! Our pets need to be cared for regularly and need to feel loved. Cuddling with our furry (or not so furry) friends benefits both you and your pet! 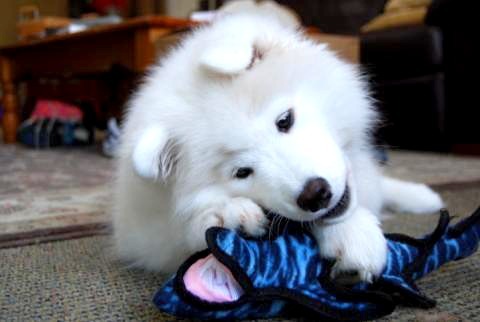 Tinkerbelle as a Puppy with Her Tuffy Toy Shark! to see more of my herd of four legged and feathered friends. Please note that this post is not sponsored. All of the products reviewed in this blog I have purchased and personally use. Good stuff! Tink is so cute as always! ohh this dog is lovely!! Your dog is absolutely gorgeous! You're so right! They need to be loved and cared for properly…and in return we get so much unconditional love! very very nice my dear!! Aw, I'm loving this post! Thanks for sharing! My dog is the love of my life, so I'll def. take these tips to heart! omg the puppy is so cute! your puppy is the cutest! he looks like a stuffed animal! Awesome post. I only have a bunny rabbit at home lol but most of your tips are applicable. Thanks for the info! These are very useful tips! Thanks for sharing! Your dog was so adorable! I dont trust myself with animals sadly, so I only have a fish… cheap and easy! omg your doggy is so cute! This is a cool place to be at! Your blog is pretty awesome! I was just looking at some of your other posts and think it's really entertaining! I think you'll see some more of me here;)! Come by mine, and let me know if you like it too! We could follow each other on GFC, Bloglovin, and Instagram too! Awww I love this 🙂 I love dogs so much!! This post makes me miss mine…I'm off at schooL 🙁 so sad. Thanks for the post though! Great tips 🙂 Come visit me sometime! Maybe we could follow each other? ?